The best value in transparent tube watercolor anywhere! This superb watercolor is made with only the finest pigments in high concentration with the finest binder to perform flawlessly to achieve brilliant and lightfast results. These sets live up to professional standards, yet allow even first time artists to experience the joys of watercolor. All colors conform to ASTM D-4236 standards. As with all of our products, your satisfaction is guaranteed! Marie's Student Watercolor Set of 12 - 12 ml tubes. Colors include: Burnt Sienna, Burnt Umber, Crimson Red, Lamp Black, Lemon Yellow, Prussian Blue, Sap Green, Vermillion, White, Yellow Ochre, Violet, and Green Deep. Marie's Extra Fine Watercolor Set of 18 - 12 ml tubes. Colors include: Burnt Sienna, Green Light, Sap Green, Burnt Umber, Lamp Black, Ultramarine Blue, Cerulean Blue, Lemon Yellow, Vermillion, Crimson Red, Orange Yellow, Violet, Gamboge, Prussian Blue, Chinese White, Green Deep, Rose and Yellow Ochre. Watercolors are indeed the art of transparency but there is a strong movement to gouache, which has always been a favorite with illustrators the world over. Gouache (opaque watercolor) has only transparent binders so colors dry without shifting—a common problem with acrylics. Gouache may be reworked because the paint film is not permanent until sealed. Gouache may be used with liquid friskets and along the same range of techniques as used with transparent watercolors. Made with the finest pigments in high concentration to yield rich and brilliant results. All colors are lightfast and conform to ASTM D-4236 standards. 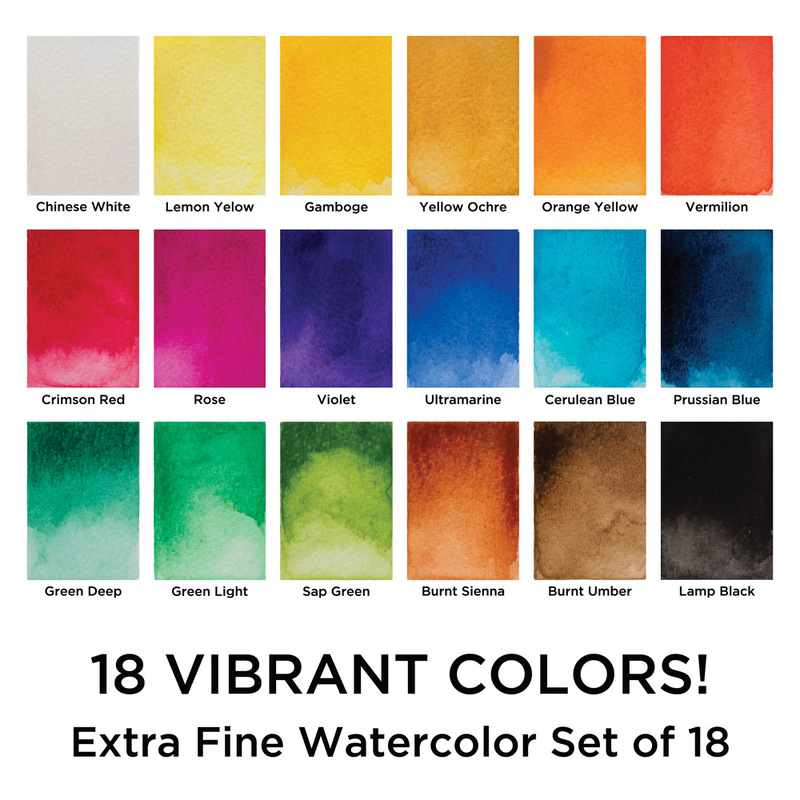 Marie's Extra Fine & Student Watercolor Sets is rated 4.6 out of 5 by 39. Rated 5 out of 5 by art dancer from Excellent quality I've been using Marie's for years, their quality is the best, the colors are rich , vibrant and light resistant. They don't fade. Rated 4 out of 5 by Cherrio from Creamy texture I bought this a month ago and have used on a project. It has a nice consistency and worked well, but begins to dry on my pallet very quickly and when I added more water the color became a little clumpy. Is it possible to get the info on pigments used? For example,lemon yellow is often PY175. I&rsquo;m not sure what the numbers on the tubes mean. Unfortunately, at this time the manufacturer, Marie's has not published a listing of the pigments included in each individual Maries color. When the manufacturer makes this information public we will post it on the product page. Please let us know if you have any other questions or concerns about this product.